When planning to follow Finnish sauna construction guidelines, you will need to build a frame and insulate the space before installing the pre-cut kit. Many homeowners with basic skills in carpentry can do much of their own construction and then have a contractor come in to do the electrical hookup. The following are the general specifications you’ll need to follow to prepare your space for sauna installation. Framing should consist of 2x4s on all four sides and the ceiling. The ceiling height should be framed at 7' or less off the floor. The base plate should consist of treated 2x4s for protection against moisture on the floor. Insulation of walls and ceiling should be done using R11 or R13 rating of conventional fiberglass batts. The ceiling of an indoor sauna will need a higher rating of between R-22 and R-26. Foil Vapor Barrier to keep moisture from collecting inside the wall needs to be of Type C construction foil over insulation or drywall in the walls and ceiling. Flooring can be any waterproof hard surface such as concrete, tile or linoleum. The doorway must be framed with a double 2x4 for added strength. The rough opening for a standard door will be 2" wider and 2" taller than the door size ordered. Once the sauna is framed and before the insulation is installed, the electrical rough-in for the heater, controls, and lights should be done by a licensed electrician. 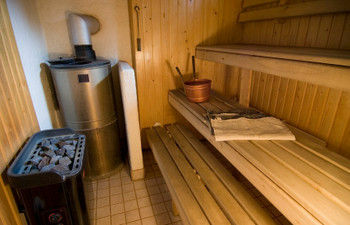 If you are installing an electric hot rock sauna heater, Finnish sauna construction guidelines specify that you must use a 15 amp split breaker, and a larger unit will need the appropriate gauge of wire (it will be specified in the heater manual) with 30 or 40 amp breakers. If the sauna heater you prefer is operated by gas or propane, you’ll need a licensed contractor to come in and install a gas line and hook up the heater. You’ll also need to obtain the proper building permits for certain types of Finnish sauna construction. Check with your local code enforcement before you begin. The pre-cut sauna kit will arrive with everything you need to complete the construction of your Finnish sauna. The kits include all materials for the sauna interior, including the benches and door, and the walls will consist of tongue & groove panels that are fit together easily. With some dealers, the heater and controls are not included and will be an additional purchase. You should compare the cost of the heater if it were sold separately to see if you can get a better price; otherwise it’s advisable to buy the heater recommended by the sauna kit dealer. Once the framing and wiring have been completed, you should be able to assemble the kit and complete your Finnish sauna construction in about 15 to 20 hours.